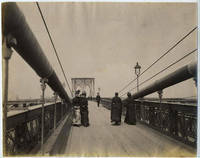 Pleasant view of the bridge as pedestrians experienced it, with a mother and daughter in hats and long skirts walking towards the viewer, and other pedestrians walking away from the viewer towards a distant Brooklyn. The main swag of piping holding the cables is the strongest architectural feature in this photo, focusing the view on the pedestrians. 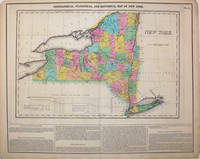 With the number 58. prefacing the title in the bottom margin, which has very slight fading. Overall the photo is in excellent condition. Albumen photo, 8 1/4 x 6 5/8"